Marketing to millennials isn’t always simple—they are some of the pickiest buyers on the market. And I would know. I am one. But, who are these millennials? And how many are there? It’s been official for a few years now—the millennial generation is the largest (overtaking the baby boomers) at 75 million millennials in the United States – that is a lot of discretionary spending dollars! And guess what? They are the most diverse as well. They range in race, socioeconomic status, job titles, political beliefs, religious beliefs, and about every other category. What does this mean for your business strategy? Gone are the times of the “cast a wide net” marketing campaigns. It’s time to dial it in. Not sure where to start? Here are a few tips to get started. Those slow load times are killing your chances. While in the past having an online presence was enough, now it has to be eye-catching. If I click on your site after a quick Google search and it takes forever for content to load. I’m leaving. If you play music over my perfectly crafted playlist, I’m going. If it looks like your website was made in the early 2000s, complete with an entire novel worth of content, you bet I’m clicking that back arrow. Captivating and enticing is the name of the game. Millennials want the information given in the least amount of words. They want relatable pictures—not the classic stock photos of happy couples. Stay true to your image, but add content that matches your customers. Millennials spend 6+ hours on social media a week. But, the platforms they use and for what purposes are changing. Let’s get real. Google+ is the aunt that you never talk to, but have to call during the holidays. Great for boosting your ranks, not ideal for reaching customers—especially millennials. Facebook is the aunt that you adore. But, you’ve started to distance yourself from her because she continually texts you. Still relevant, but it’s decreasing. Facebook is saturated. Everyone flocked to Facebook during the first social media craze. It’s time to branch out. Millennials interact with Twitter, Instagram, Snapchat, and Pinterest daily. It’s time to make one of those platforms work for you. And guess what, not every platform will make sense for you. The point is to be different, reach more people and stop staying in your comfort zone because you’ve been there before. Throw the hard sell routine in the trash. If you want to capture the attention of millennials, then live your brand and mission—be yourself. Marketing to millennials means marketing who you are. Instead of selling products, sell you. I would rather spend an extra $10 on a brand who I know and trust than on the greedy giants. Let us into your world. Not sure how to start? Be transparent on social media. Show us all the ins-and-outs of daily life. Or highlight the About Us or Mission Statement up front and center on your website. Just let us have a glimpse. On the same note, we trust our peers more than you. In fact, 83% of people value their friends and family opinions’ most, followed by 66% trusting online opinions. If it works for your business, look into advocacy marketing. What is it? It’s a brand advocate. Someone in the community that partners with you, sharing unique, trusted and shareable content on social media. Text over calling, the new rule. That includes business. I have an actual aversion to companies when I realize the only way to contact them is by phone. Preferably, I’d fill out the Contact Us form, email, message, or slide into your DM’s. But, we still want the same immediacy associated with calling. When choosing between two companies, I automatically like whichever one answers me first. It shows you are accessible. Additionally, you care. We know you have a busy day, but you took the time replying—and that matters. We want to feel like you know us. That not just your product, but your business, matches us. It’s going to take self-reflection. You have to find out who your ideal customer is and what their common (or uncommon) thread is. Once you get that answer, you have your new marketing base. But, that’s scary. Putting all your force into one group, ignoring others isn’t a winning strategy unless you have taken the time determining and understanding your customers. But, if you care, we will care. Put in the time and we will put in the money. Marketing to millennials can be hard to understand, but not impossible. The main take away? Show you care. You have to give an effort. 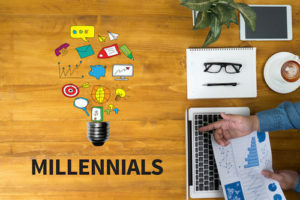 Whether that is perfecting your website, expanding your social media presence or being there when we need answers, you have to put the effort in to get the reward—millennial’s business.